Cleanses and purifies for clear, problem-free skin. 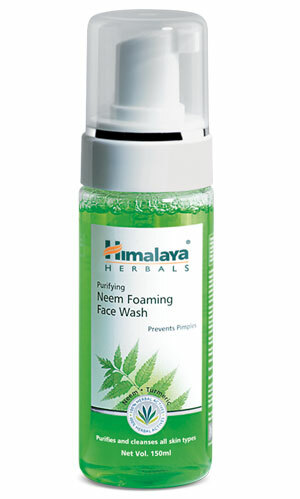 Specially formulated to give you clear, problem- free skin, Himalaya Herbals Purifying Neem Foaming Face Wash is a soap-free, daily-use foaming face wash that spreads smoothly over your face and removes excess oil and impurities without over-drying. Neem, well-known for its purifying and antibacterial properties, kills problem-causing bacteria. Combined with Turmeric, our Purifying Neem Foaming Face Wash helps control acne and pimples, leaving your skin soft, clear, refreshed and problem-free. Moisten the face and spread the foam from Himalaya Herbals Purifying Neem Foaming Face Wash gently all over, avoiding the delicate eye area. Wash off and pat dry. For best results, also use Himalaya Herbals Purifying Neem Scrub and Himalaya Herbals Purifying Neem Mask.